Cleaner. Never run K & N Filters dry! 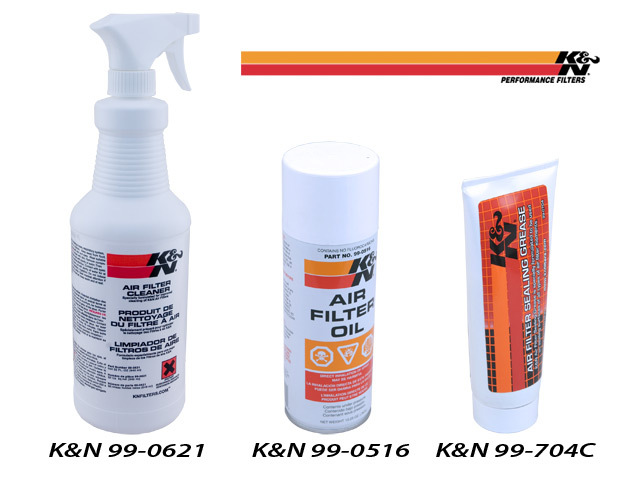 K & N Air Filter Cleaner is formulated to clean K & N Filtercharger elements. The use of other cleaning solutions can void the filter's warranty, and quite possibly could damage the cotton material. Never use solvent or harsh chemicals to clean a K & N Filter. K & N Cleaner works to dissolve the dirt build up and old filter oil. We reccomend using a brush to remove majority of dirt, then using shallow pan, immerse filter im cleaner and let soak for about 10 minutes, lastly back flush dirt with clean water. Let dry completely, then re-apply K & N Filter Oil. K & N Sealing Grease is High Temp so it won't run off or melt. This grease provides an airtight fit around sealing surfaces on all types of air filter elements. Seals againt air leakage and prevents dirt from entering intake. 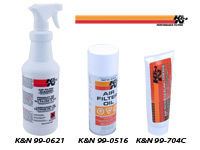 K & N sealing grease is not to be used on clamp-on filter elements.